A stoneware bowl of wide conical form, the sloping sides rising from a short foot and curving inwards slightly at the rim. A thick glossy black glaze, which is suffused with matt russet splashes that radiate from the centre, covers the interior of the bowl. The glaze extends over the rim, stopping in an uneven line around the middle of the exterior. The unglazed part of the bowl shows the dense, fine-grained buff stoneware body. Fine black-glazed wares became increasingly popular during the Song dynasty due to the emergence of the tea drinking culture. 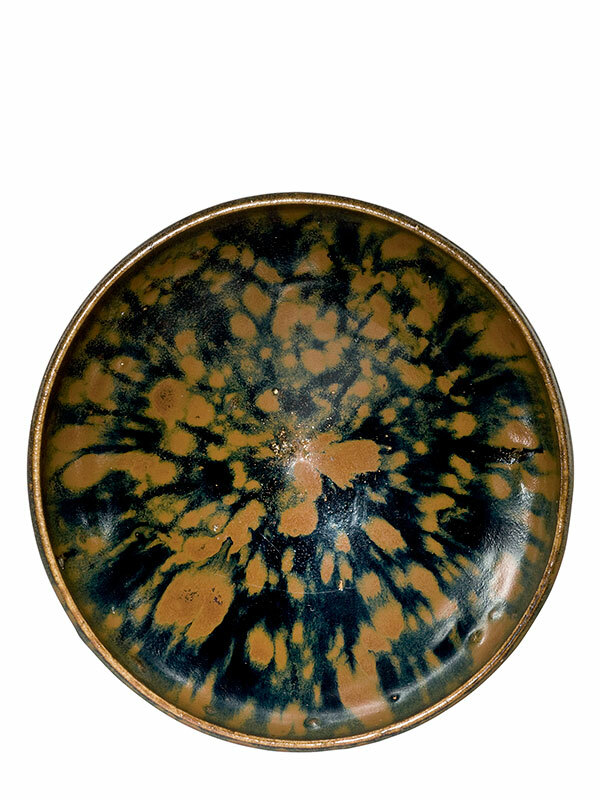 Sophisticated black-glazed bowls, such as the present example, were further applied with iron-oxide russet splashes to the black glaze surface, resulting in a type of glaze referred to in texts as ‘partridge feather’ glaze. The practice of leaving the lower portion of the vessel unglazed, which can be observed in the present example, was revived by Cizhou potters from the late 11th or early 12th century. Two closely comparable examples with very similar glaze and stoneware body, both dated to the 11th or 12th century of the Northern Song dynasty, are in the Meiyintang collection. Further comparable examples with similar glaze and of various sizes and proportions are respectively in the collections of the Victoria and Albert Museum, the Arthur M. Sackler Museum, Harvard University Art Museums, and the Ashmolean Museum in Oxford.